Aquatic adventurers can practise their best dives into the pool with these super-stretchy bikini bottoms. Contrast trims and colourful patterns look fun in the sun, while the classic brief shape is comfortable enough to keep splashing and swimming all day. Ready to hit the beach? Those sandcastles won't build themselves! This bikini top has a hint of stretch, completed with fun frills and contrast binding, ready for mixing or matching with a range of printed bikini bottoms. From building sandcastles on the beach to practising cannonballs in the pool, our cool and comfortable swim shorts are ready for adventure. They come in a choice of block colours or prints with contrasting bindings, perfect for teaming with a bikini or rash vest. Our frilly swim briefs will turn any mermaid's tail green with envy. They're perfect for splashing on the shore and showing off new moves at the swimming pool. Mix or match them and let the aquatic fun begin. A picture paints a thousand words, and sometimes a word paints a picture. Take the neon animals on our long-sleeved jersey T-shirts, perfect for early morning safari drives (or just going to the park with the grown-ups). Kick back in these laid-back sweatpants – and check out the hidden camo lining. Crafted from cotton, they're cosy for lounging at home, while the drawstring with a flash of fluoro colour keeps them in place when running around. Did someone say 'NEON'? With a fluoro coral upper, these sandals are the definition of fun. 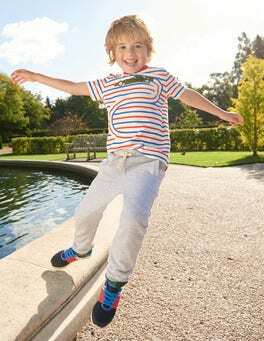 The cork footbed is super comfortable for all-day wear and we added a large buckle so they're super easy to pop on for sprinting after the ice-cream van. Who has time for laces when there's so much to explore? Our soft canvas shoes have a new and improved material that is supersoft and comfortable, and perfect for speedy slip-ons when there's a game in the garden that can't wait. You won't fail to spot the new neon option, too. 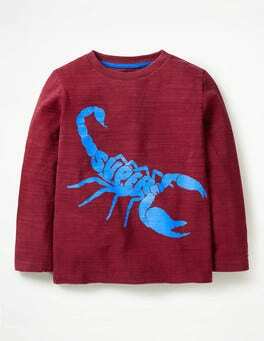 …rash vest set is just the thing for mini sailors making a splash at the pool or the seaside. Choose between the embroidered strawberries and the delicate broderie trim and fluoro stitching design. 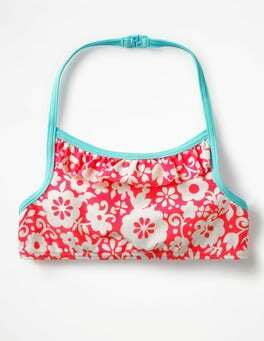 Either way, it's finished with frills for extra fun and has UPF 40+ sun protection to keep baby happy.